Their name, Velociraptor means "Speedy Thief". They were characterized as being the smallest type of raptor dinosaur. With slender legs, and an S-shaped neck and spine, they were quick and agile at jumping, running and hunting. This species of dinosaur was bipedal, which means they ran on two-legs instead if four. Velociraptors were meat-eaters, carnivorous. They had approximately 80 very sharp, curved teeth, and a long, flat snout. Some teeth measured over an inch (2.5 cm) long. These carnivores lived during the Cretaceous period, about 85 million years ago. Velociraptor was a carnivore who probably ate anything it could capture. Since its size was no larger than a Great Dane, the most likely prey was small, young, plant-eating dinosaurs. However, many of the Velociraptor skeletal remains have been found in close proximately of each other, which leads scientists to believe that the Velociraptor probably hunted in packs. Velociraptors were swift and agile hunters with 3 claws on their forelegs and 4 claws on their hind legs. They used their front claws to capture and hold their prey while they ate. Many species of dinosaurs, much larger than the Velociraptor, could easily become prey to a pack of hungry Velociraptors. 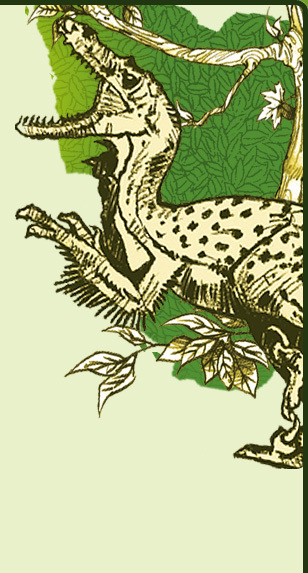 The Velociraptor lived in a desert-like environment that had some streams, trees, and shrubs. Velociraptor fossils have been found in what is now known as the "Gobi Desert", which covers Southern Mongolia and parts of Northern China. In 1971, a Velociraptor skeleton was found in a death struggle with a Protoceratops. Both skeletons were found intact. Somehow they were both buried while the Velociraptor was attacking. Predators of the camivorous Velociraptor were probably other camivorous dinosaurs, but none could prey on the Velociraptor without a vicious fight. As pack hunters, the Velociraptor may have had some social structure within their pack similar to other animal species that hunt in packs. Velociraptor had fairly large brains, compared to other dinosaur species, which made them one of the most intelligent of dinosaurs. The study of dinosaur skulls demonstrates that the Velociraptor had excellent hearing, a powerful sense of smell, and binocular vision. All dinosaurs have a notch in their skull and middle ear bones where the tight ear drum stretched. Crocodiles and birds, both of which are related to the dinosaurs, have a keen sense of hearing, so it is not surprising that dinosaurs also had an acute sense of hearing. Nerve endings around the outside of the Velociraptor's skull and the large olfactory lobes, suggests that the dinosaur's snout was highly sensitive to touch and smells. The Velociraptor like other predators have binocular vision, which allows them to see three dimensionally while hunting and capturing prey. The discovery of an unusually well-preserved fossil in the Gobi Desert caused such a sensation. The fossil comprised a Protoceratops and Velociraptor in combat. The Velociraptor, its chest crushed, still had its claws gripped behind the Protoceratop's neck frill. Just below the bodies was a nest of Protoceratop's eggs, so perhaps the Velociraptor was caught in the act of robbery. One theory suggests that both dinosaurs were overcome by a sudden, massive sandstorm as they fought, and died simultaneously.